There’s something deeply satisfying about ordering the whole menu. No faff, no compromise. Simple. We’ll just have it all. I've only managed this on a couple of occasions, normally it’s practically, financially and gastric…ly unfeasible. It’s also rare, even for a practiced glutton such as myself, that I’d want to try all the dishes. But that’s what we did at Homeslice. 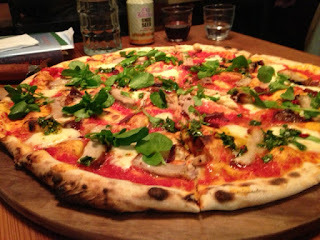 In their own words “wood fired pizza from the streets, Homeslice began with a home built mobile wood fired oven in the court yard of London Fields Brewery. The aim was to create pizzas that we wanted to eat. After two nomadic years we've now found a home. PIZZA, BEER, WINE, PROSECCO.” Welcome home. 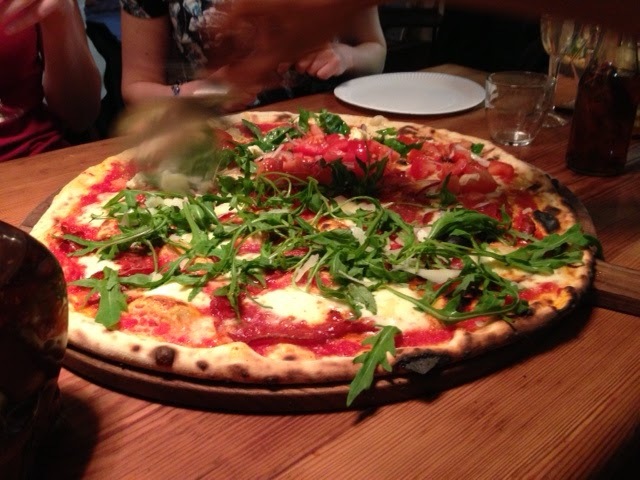 I’ve been a fan of Homeslice for ages, part of the first wave on the London street food scene and a consistent performer serving up slice after slice of novel topping combinations. Don’t get me wrong, this isn’t novelty for the sake of it, we’re not talking Fire and Stone, these guys know what they’re doing and know what flavour combinations work. Their Covent Garden home is a partnership between original founder Ry Jessup and Mark Wogan, TV chef, restaurateur and son of Terry so I’m led to believe. 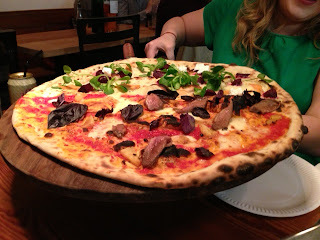 It’s a great space, stripped back with around 50 covers spaced on chunky wooden tables, tiling my girlfriend approved of, a prominent, beast of an oven which I approved of, and large handwritten chalkboard with the day’s pizzas. Further backing to my theory that handwritten chalkboard menus are a hallmark of good restaurants. 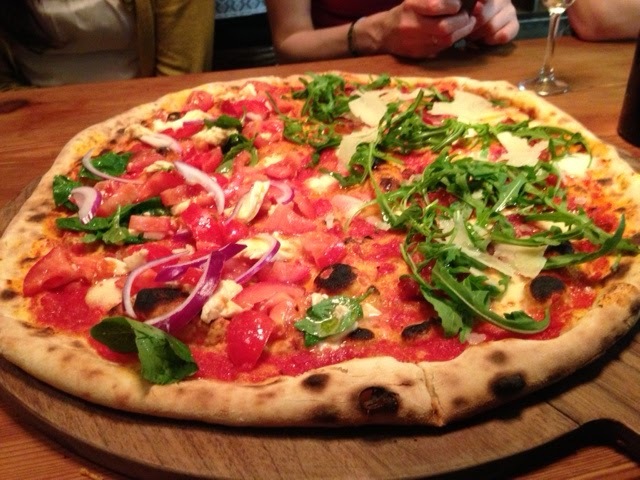 They had 7 pizzas on for our visit, 3 available by the slice with the remaining coming as whole 20” pizzas but with the option to split two toppings ‘half and half’. There were 7 of us, so we split the first 6 toppings across 3 pizzas with a 4th pizza devoted to the final topping, pork belly, chimichurri & smoked onion – it’d have been rude not to. Highlights for me included the latter (obviously), the acidity of the chimichurri, added after baking regained its freshness and cut through the richness of the pork. 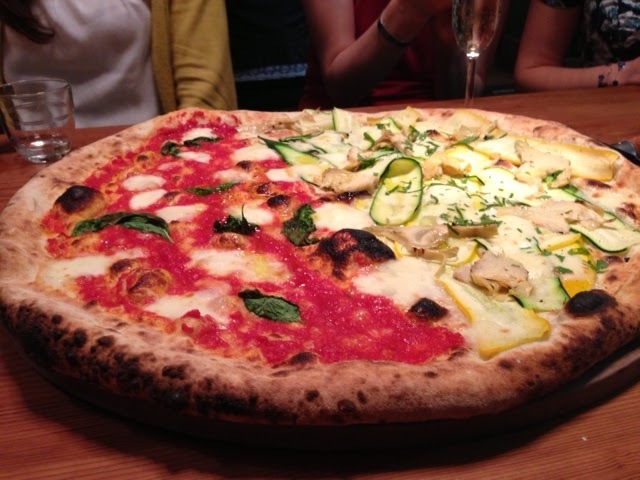 Several of the vegetarian options also stood out, the courgette & artichoke on a garlic base was first out the oven with the ribbons of courgette retaining their bite and the Caprese pizza, groaning under the weight of the fresh tomato and mozzarella salad showcased the quality of the ingredients. 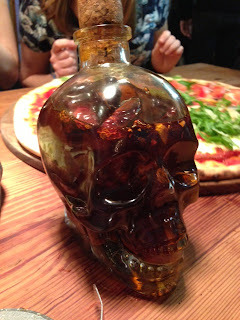 For an encore, we ordered a 5th pizza, half Caprese, half Sopressata (Italian salami) & Rocket, the salami worked well with their chilli oil although their ‘super hot’ oil, stored in a glass skull is still restrained on the scoville scale. Drinks were straight forward too, beer, wine or prosecco. I spied Kernel beers in the fridge but opted for wine on this occasion, served by the magnum you take as much as you like and pay by the glass as they measure what’s left (or not) in the bottle. I like the idea, I suspect it works well for them too, especially if your friends are anything like mine, refuse to leave any alcohol on the table, and revel in the challenge of polishing off a couple of magnums on a school night. Error. 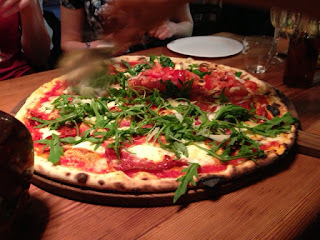 Front of house were friendly, knowledgeable and on form with their banter, Mark giving the table a pizza cutting master class and claiming he'd absolve my friend of responsibility and repercussions if he took on the challenge of a magnum to himself. A swift boot from his other half put him back in check. Prices are reasonable, £4 a slice, £20 for the whole 20" pizza, which servers 2 normal people and £4 a glass of wine too.